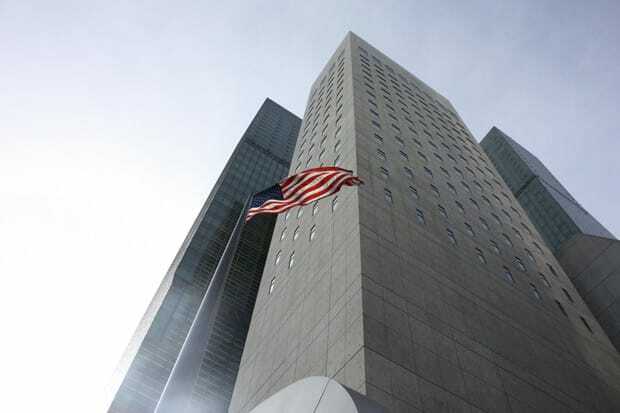 Designed by Gwathmey, Siegel and Associates, the new United States Mission to the United Nations, at 799 UN Plaza, continues in the traditional formal organization of a skyscraper with its base, middle, and top. Designed to meet the stringent blast resistance requirements of all Federal buildings post 9/11, this 22-story tower located just across the street from the General Assembly Building is a modern day fortress. Completed in 2010, this contemporary bunker replaces the previous home of the United States Mission that was designed in 1960 by the office of Kahn & Jacobs. That structure too, with its heavy concrete façade was a monument to indestructibility, but by the late 1990’s was too small for its use. Although it was commissioned during the Clinton era, George W. gave his blessing for the final design and it is his name that will be forever engraved in the limestone base. The base, an organic curvilinear form, tries to disguise the heaviness of the tower. But even through the glass wall, we can see the monolithic concrete tower extending to the ground. The uniform gridding of the concrete panels, however, are delicately offset by the gentile increase in the windows' size to draw the eye up the tower. This feat, despite the clumsiness of the base, manages to give the tower its elegance while meeting the restrictions of the security requirements. Atop the tower is a simple stone cylinder, within which are located press conference facilities. The panoramic views are blocked in two directions by the taller One UN Plaza, but the backdrop of the Secretariat Building to the east would make for perfect proclamations. Architecturally, however, the crown merely states this is the top. Compared to the beauty of the UN complex across the street, this tower is no major significant design of grace or sophistication, but standing on its own it contains elements that make it worth a second look. And should terrorists actually get World War III going across the street, given its structural fortifications, it just might be the only building left standing.